Summon: Summon a 0/1 Target with Guard for your opponent. 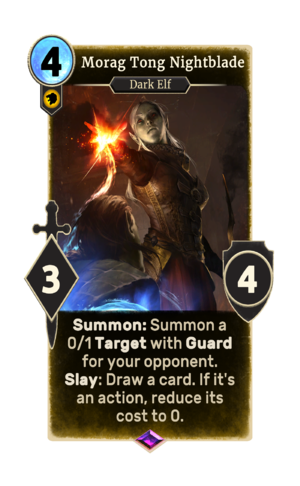 Morag Tong Nightblade is an epic Willpower creature card. It is part of the Houses of Morrowind expansion. "They will never know I was there." This page was last modified on 28 February 2019, at 00:04.